We were seated next to a North Korean superstar and we didn’t realize it. 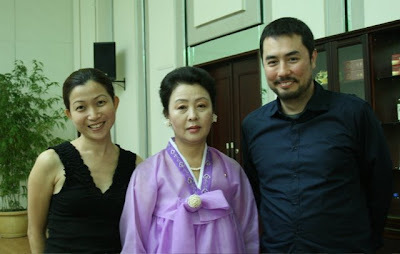 Our translator introduced her as the Famous Actress – Hong Yong-hui. We didn’t understand just how famous until sometime towards the end of the dinner. A stream of fans marched up to say hello, and suddenly we were surrounded by people who couldn’t stop gushing, folks who wouldn’t stop taking pictures. It was overwhelming even for her, the Superstar. 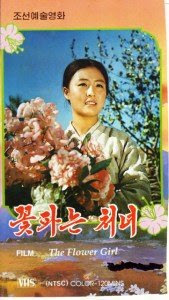 Millions of North Koreans and Chinese know her as The Flower Girl. And while the character she’s best known for playing is pretty remarkable, Hong’s story is itself, worth a movie. She told us she was just a student when she was picked to star in the film. She said she was 16 and had no experience as an actress. So what is it like being a movie star in your country? This country? What have you seen? What’s the Dear Leader like? We left the unspoken, unspoken. Made more small talk. Joked about the food. She told us the experience changed her but didn’t elaborate. She’s still an actress, and a frequent guest lecturer at the North Korean Film School. And what’s that like? What’s everything like? It was hard to ask – she was so very refined and regal and polite, it felt rude to push. We watched The Flower Girl a few days later. A friend had warned us to be prepared to shoot ourselves by the end of screening. We laughed, but left understanding what he meant. The film tells the story of a Koppun, a young North Korean girl who sells flowers to help support her sick mother and blind sister. Their father is dead, their brother, in prison. Landless peasants, the family is indebted to their very nasty landlord who squeezes them for everything he can get. Koppun struggles to save up to buy medicine for her mother. But the old woman dies despite her daughter’s best efforts. The situation gets steadily worse before things get just a tiny bit better. And by the end of it, the message is clear – LANDLORDS ARE BAD. PEASANTS MUST REVOLT. CLASS DISTINCTIONS ARE BAD. We heard more than a few sniffles in the cinema. And truth be told, it was hard not leaving without feeling slightly sniffly. Yes, the film was over-the-top. Incredibly melodramatic. But it was beautifully shot, and Hong gave a great performance as Koppun. Hard to believe she was only 16 then. 1972. A lot has happened since. She said as much over dinner that first day at the festival. I was very young. And now I am in my 50s. And then she got caught up with her fans and didn’t say much more. And we didn’t ask. And then she shook our hands and said goodbye.